Century - For top of the line styling, choose Nouveau. It features recessed, dark tint side split windows. The front is stationary, and the rear screened windows tip-out. The twist handle rear door, third brake light, framed front picture window and carpeted interior are standard. 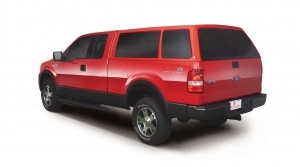 See what fits your truck! For top of the line styling, choose Nouveau. It features recessed, dark tint side split windows. The front is stationary, and the rear screened windows tip-out. The twist handle rear door, third brake light, framed front picture window and carpeted interior are standard.